Tendons are strong cords of fibrous tissue that attach muscles to bones. The quadriceps tendon works with the muscles in the front of your thigh to straighten your leg. Small tears of the tendon can make it difficult to walk and participate in other daily activities. 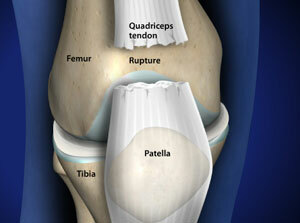 A large tear of the quadriceps tendon is a disabling injury. 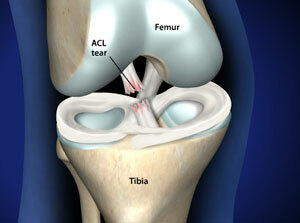 It usually requires surgery and physical therapy to regain full knee function. Quadriceps tendon tears are not common. They most often occur among middle-aged people who play running or jumping sports. 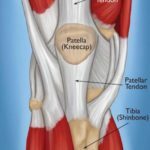 Quadriceps Tendon Rupture occurs when the tendon that holds the patella, (the knee cap), to the thigh muscle in the knee tears and splits apart, allowing the patella to slide downward. This causes pain and an inability to straighten the knee. When a quadriceps tendon tears, there is often a tearing or popping sensation. 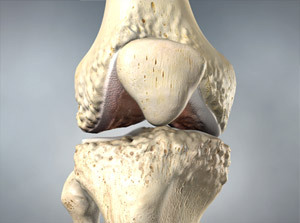 Pain and swelling typically follow, and you may not be able to straighten your knee. What Happens after a Quadriceps Tendon Tear? Your doctor will discuss your general health and the symptoms you are experiencing. He or she will also ask you about your medical history. After discussing your symptoms and medical history, your doctor will conduct a thorough examination of your knee. To determine the exact cause of your symptoms, your doctor will test how well you can extend, or straighten, your knee. While this part of the examination can be painful, it is important to identify a quadriceps tendon tear. Hospital stay? Although tendon repairs are sometimes done on an outpatient basis, most people do stay in the hospital at least one night after this operation. Whether or not you will need to stay overnight will depend on your medical needs. To reattach the tendon, sutures are placed in the tendon and then threaded through drill holes in the kneecap. The sutures are tied at the bottom of the kneecap. Your surgeon will carefully tie the sutures to get the right tension in the tendon. This will also make sure the position of the kneecap closely matches that of your uninjured kneecap. A recent development in quadriceps tendon repair is the use of suture anchors. Surgeons attach the tendon to the bone using small metal implants (called suture anchors). Using these anchors means that drill holes in the kneecap are not necessary. This is a new technique, so data is still being collected on its effectiveness. Most orthopaedic research on quadriceps tendon repair involves the direct suture repair with the drill holes in the kneecap.